As a manager, you face growing pressures to improve productivity, decrease expenses, and motivate employees. Being a leader in today's workforce has never been tougher. Virtually all managers make mistakes along the way, including working harder, working longer, and demanding more from their employees. If you ever dreamed of accomplishing twice as much, twice as fast, and with half the budget, it's time you discovered the remarkable secret of today's top managers. The E-Myth Manager Seminar explores a radical new approach to management. Find out what type of manager you are, and how you can learn to work on the business, instead of in the business. Too many managers do the work themselves, instead of seeing that the work gets done. Others try to coerce or manipulate their employees into becoming more productive. But the key to effective management and efficient use of time is to create a system that employees can manage themselves. This program will help you inspire and organize your team to achieve amazing results. You'll learn how to get average people to produce superior results. Regardless of whether you are a small business, big business, or home-office manager, you'll benefit from Michael Gerber's revolutionary-Myth formula. This new method is currently being used by the best-managed companies in America, such as FedEx, McDonald's, Ritz-Carlton, and Nordstrom, along with thousands of other fast-growing businesses. The E-Myth Manager Seminar will revolutionize the way you manage. It will help you take control of your job, your employees, and your life, as you accomplish more than you ever thought possible. E-Myth managers have a clear vision of the future, a focused plan, and the ability to communicate and motivate. Once you acquire these skills, your business or department will soon be running itself. That's a promise. Michael Gerber is the Master of small business success. He speaks from true business experiences. 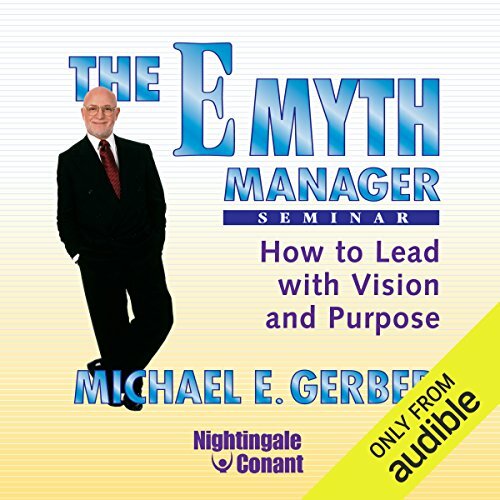 Let me start by saying, I’m a Michael Gerber fan, I LOVED the original E myth. This recording is 5 hours, 16 minutes and 19 seconds. It contains 15 minutes of brilliance, 15 minutes of great material, 15 of good information and another 15 minutes could tie all the points together. Unfortunately, there’s 4 hours, 16 minutes and 19 seconds of Michael Gerber rambling and enjoying hearing himself feel important. I’m a get to the point kind of person and found the presentation virtually intolerable. If you’re a stop and smell the flowers person with extra time to waste, you’ll probably like it. Thinking of this presentation as a treasure hunt. There are nuggets of GOLD hidden in here, you have to flex your mental focus to endure the hours of BS between the good stuff. in a nutshell, work on the business and not in the business. Create processes and procedures and mange those instead of people. if your business depends on you, then you have a job not a business. Change your approach to your business. he ranted a but the info is good. the author may have many interesting things to say although unfortunately in this audio book it seems as though the sound of his own voice is the most important. great information with some chapters being not as great as others, but overall very useful. This book would not have as much meaning to a new business person that has not already struggled and discovered the problems this book seeks to help fix. loved it. it was a mind opening experience. I recommend this book for others who r looking for become a successful business manager.